This will be a really long post and will get a bit technical for some people. The TLDR version is that we have made a significant infrastructure upgrades in the last few months that will allow our service to scale in the coming years without any worries of downtime and potential data loss. 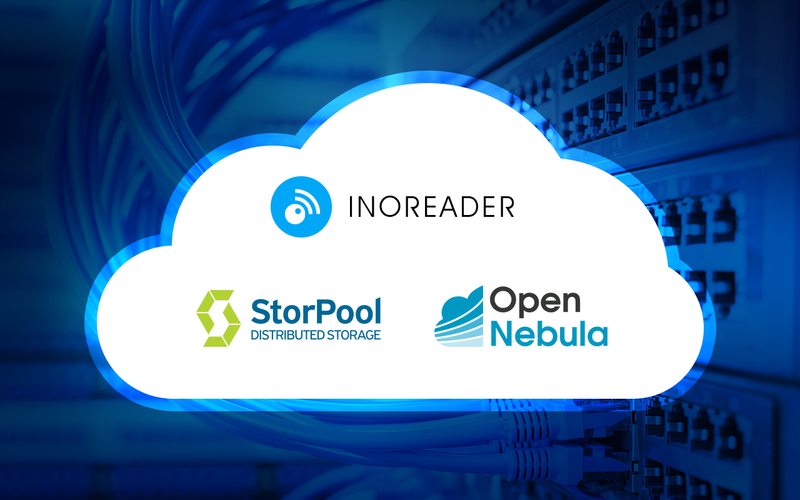 We’ve been able to greatly improve our capacity and flexibility thanks to the great combination of OpenNebula and StorPool. 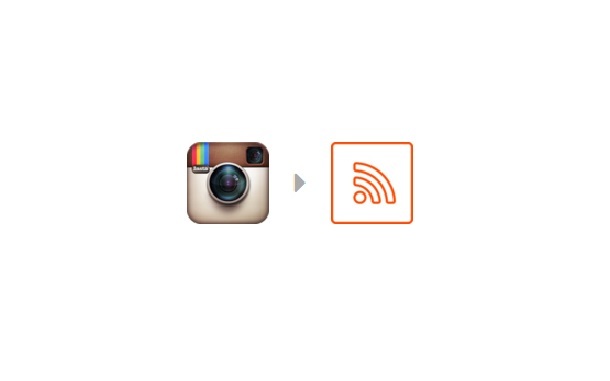 If you are tech geek like us, it might be interesting for you to read more about our journey. 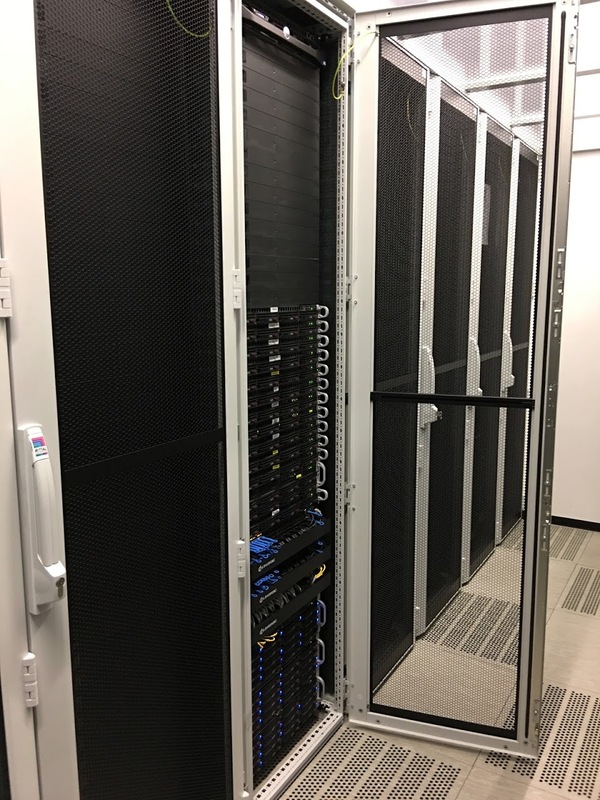 We are using our own hardware collocated in a highly secure datacenter at Equinix, just 30 minutes away from our main office. This solution allows us to be independent in terms of our infrastructure. If something breaks, we don’t need to wait for ticket resolution somewhere. We just go there and fix it by ourselves. The Internet knows enough horror stories, like the recent 3-day outage of Cast or how the The FBI stole an Instapaper server back in 2011. We will not allow this to happen to us. More than half of those servers were databases, each with its own storage. Usually 4 to 8 spinning disks in RAID-10 mode with expensive RAID controllers equipped with cache modules and BBUs. All this was required to keep up with the needed throughput. There is one big issue with this setup. Once a database server fills up (usually at around 3TB) we buy another one and this one becomes read-only. CPUs and memory on those servers remain heavily underutilized while the storage is full. For a long time we knew we have to do something about it, otherwise we would soon need to rent a second rack, which would have doubled our bill. The cost was not the primary concern. It just didn’t feel right to have a rack full of expensive servers that we couldn’t fully utilize because their storage was full. Furthermore redundancy was an issue too. We had redundancy on the application servers, but for databases with this size it’s very hard to keep everything redundant and fully backed up. Two years ago we had a major incident that almost cost us an entire server with 3TB of data, holding several months worth of article data. We have completely recovered all data, but this was close. This part is even more important than the choice of a hypervisor since it holds all our (and yours too!) data. If anything ever happens there we will be exposed. So we were very careful to select the perfect solution and there were many. We also decided to boost all servers to 128G of RAM. We had different configurations, but most servers were having 16-64GB and only a handful were already at 128G. So we’ve made some calculations and ordered 20+ CPUs and 500+GB of memory. A big shoutout here to Michael Goodliffe from ViralVPS who provided us with great discounts so we didn’t overshoot our budget too much. DDR memory is very expensive at the moment! After we placed all orders we had about a month before everything arrives, so we used that time to prepare what we can without additional hardware. 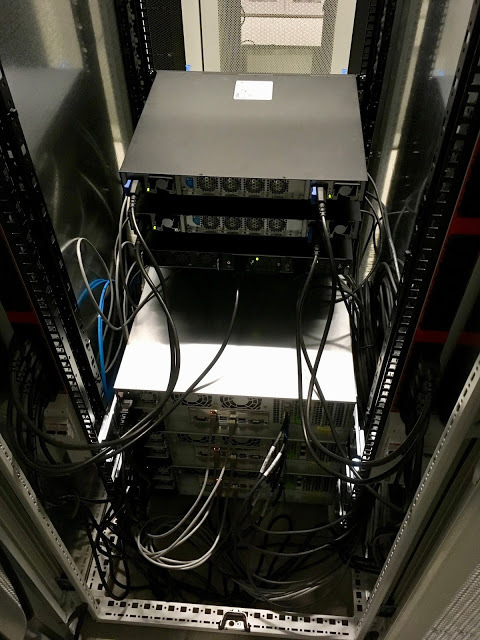 The first thing we did was to upgrade to replace the old switches in the current rack with one Quanta LB4-M which will allow us to link to the new rack with 2x10G connection. We’ve also arranged the cables in a neat cable management panel. Check again the first photo in this post to see the difference. The empty switch below the panel was placed to fail-over. 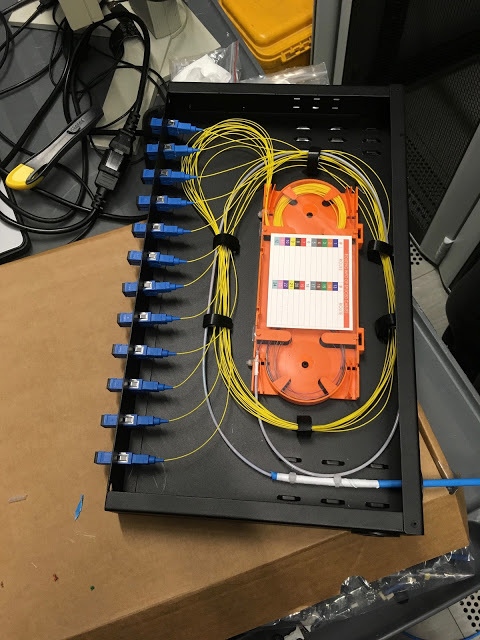 In case something happened with the main switch, we could easily reconnect all cables to the second, because we have mirrored the configuration to it. After setting up the network we had to wait a bit more for the StorPool servers to arrive. 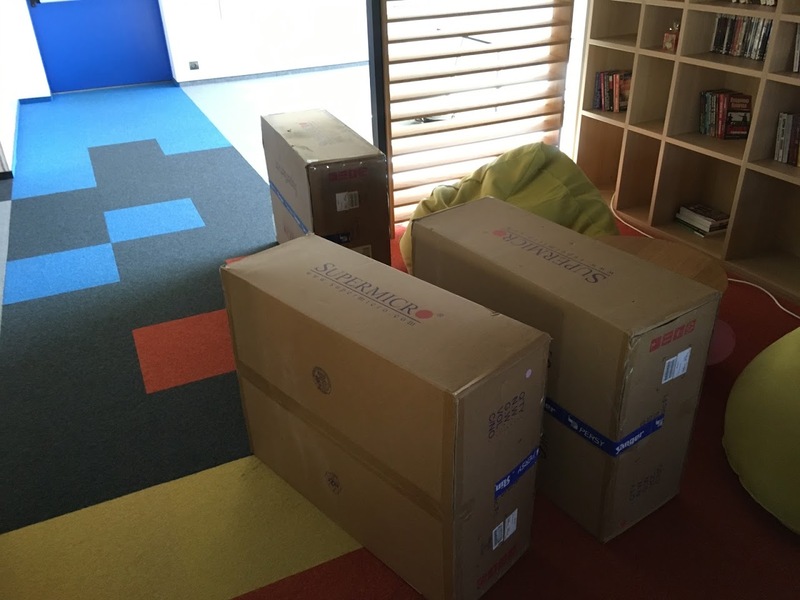 Due to some delays they landed in our office in late January. It was a late Friday afternoon, but we immediately started working on them and by the evening they were installed and ready for the guys from StorPool to take over remotely and start the stress testing and the initial setup. 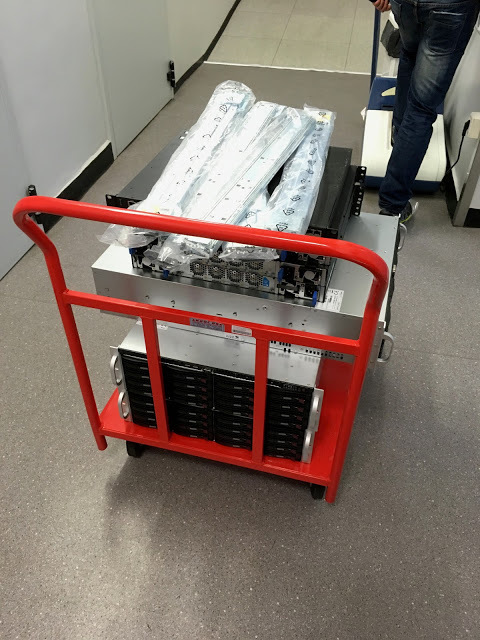 Kudos to the guys from StorPool for making sure the servers are ready for deployment by Monday! Monday came and after a confirmation from StorPool that the servers are ready, we grabbed them, the 10G switches and some cables and headed straight to our datacenter to install them. Several hours later the empty rack wasn’t so empty anymore. 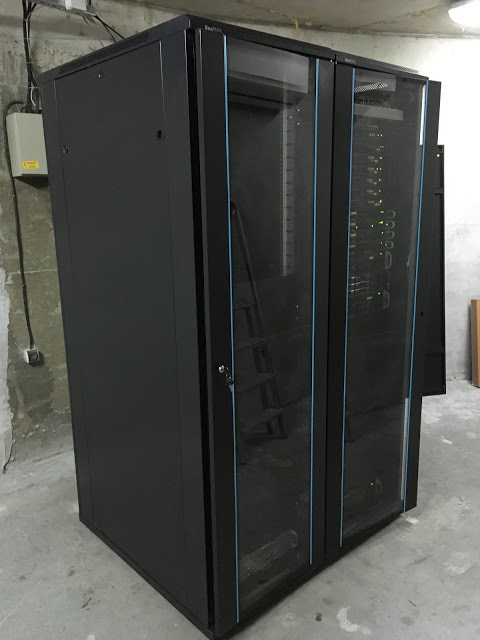 We have installed the servers and configured both the 1G and 10G networks, connected it with the old rack and tested the infrastructure. As you can probably see from the pictures, everything is redundant. Each server and switch has two power supplies connected to independent circuits. Each server also has two 10G network interfaces connected to different switches so in case one fails, the other will take over. The actual storage layer has 3x redundancy, which means that we can lose two servers without any data loss! If you’ve ever contacted our support chances are you already know this guy. That’s our own Rosen (a.k.a. wesson) arranging some cables here. Notice that still only half of the drives are lit. 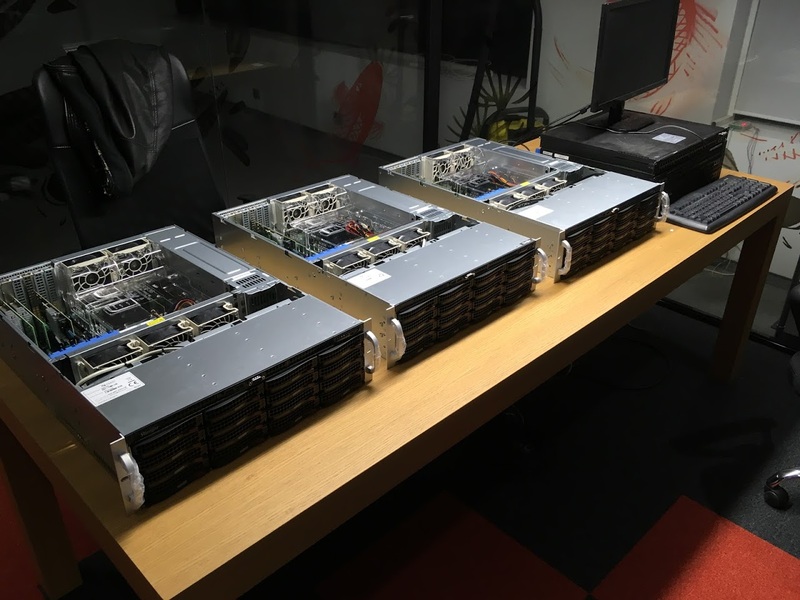 We added 24 more drives that we salvaged from our old servers after two weeks. 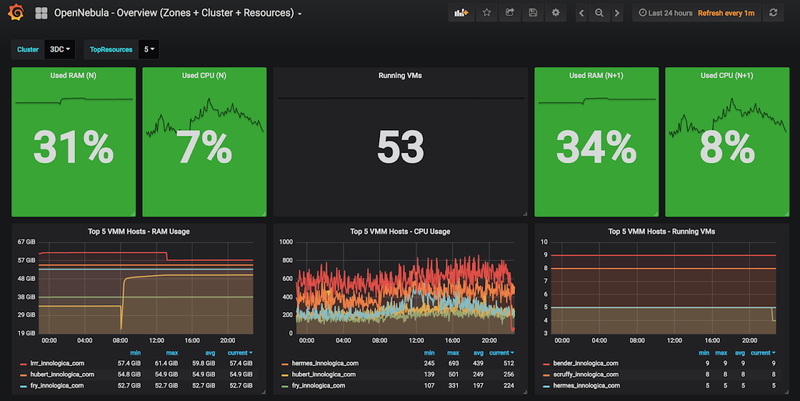 Not all servers went into our OpenNebula cluster. Some were single CPU servers and some were storage-specific machines. 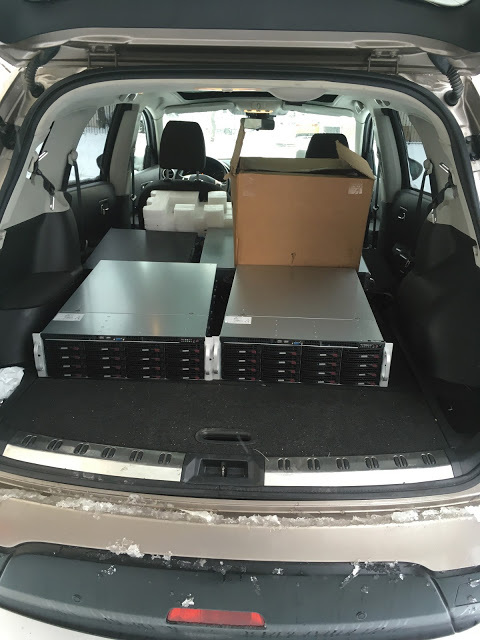 Those went into our new backup datacenter, but more on this later. After that each server went through a complete change. 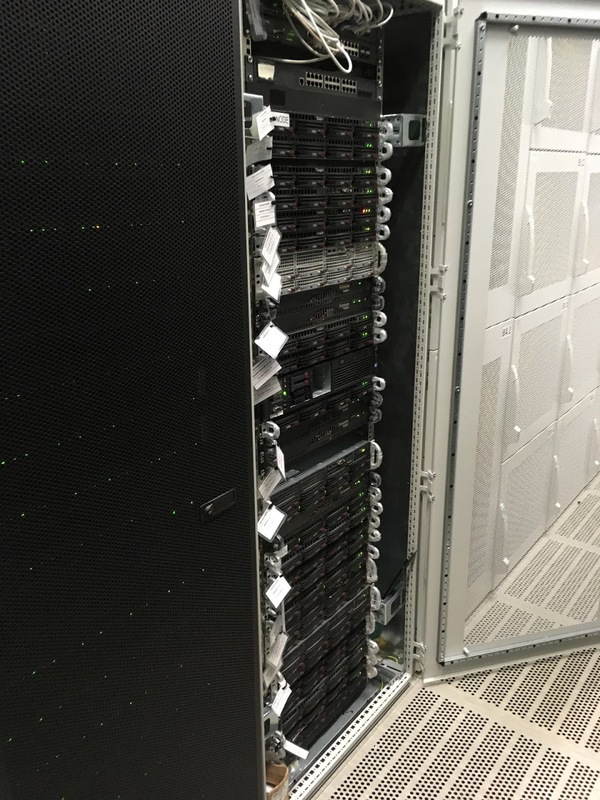 CPUs and memory were upgraded, the expensive RAID controllers were removed from the expansion slots and in their place we installed 10G network cards. Large (>2TB) hard drives were removed and smaller drives were installed just to install the OS. 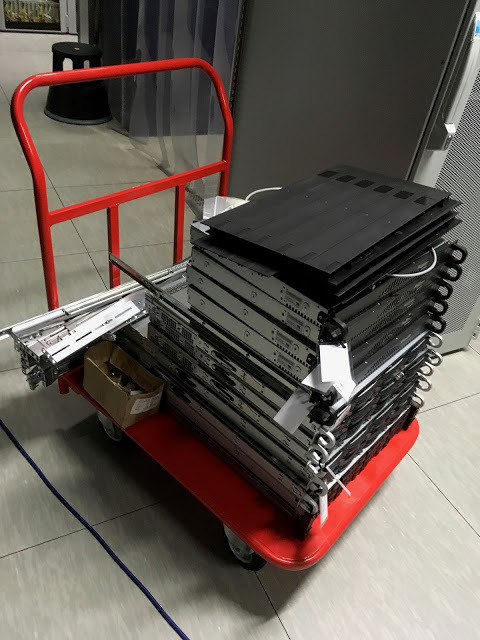 Thanks to a special staging room in the datacenter we didn’t have to haul them each time to our main office and back. 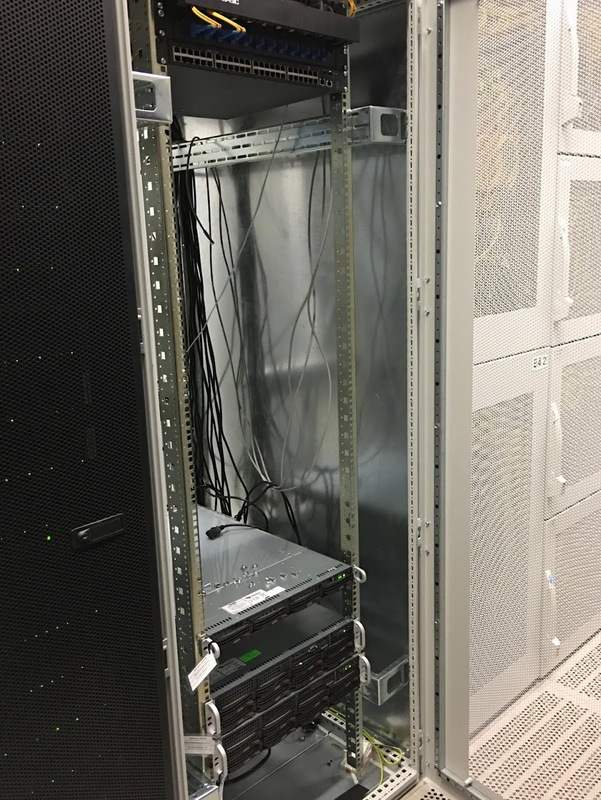 After the servers were re-equipped, they were installed in the new rack and connected to the OpenNebula cluster. 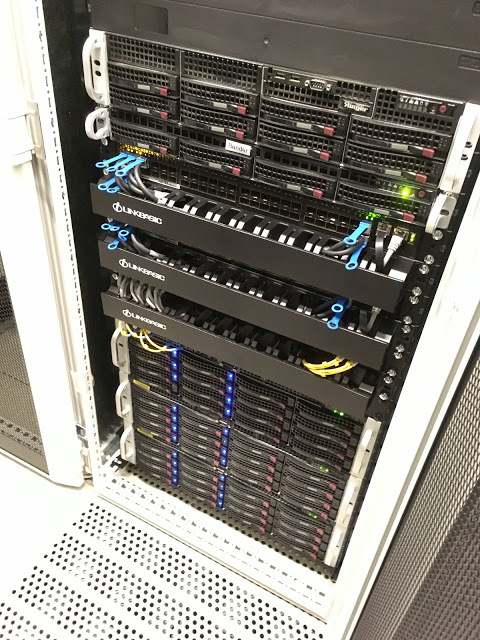 The guys from StorPool configured each server to have a connection to the storage and verified that it is ready for production use. 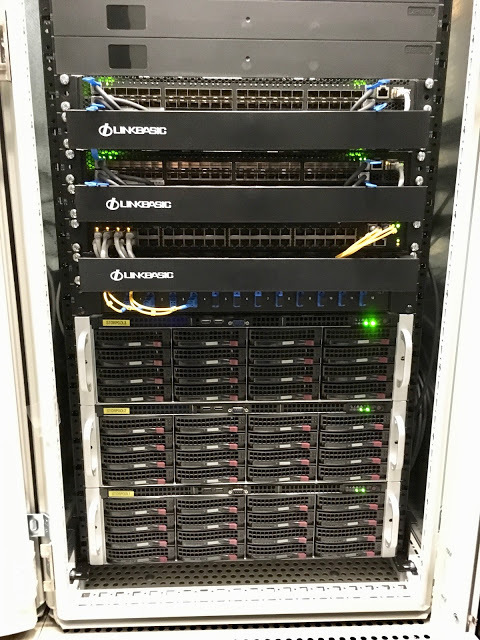 The first 24 leftover 2TB hard drives were immediately put to work into our StorPool cluster and the rest went into our backup datacenter. This process was repeated several times until we ran out of servers in the old rack. 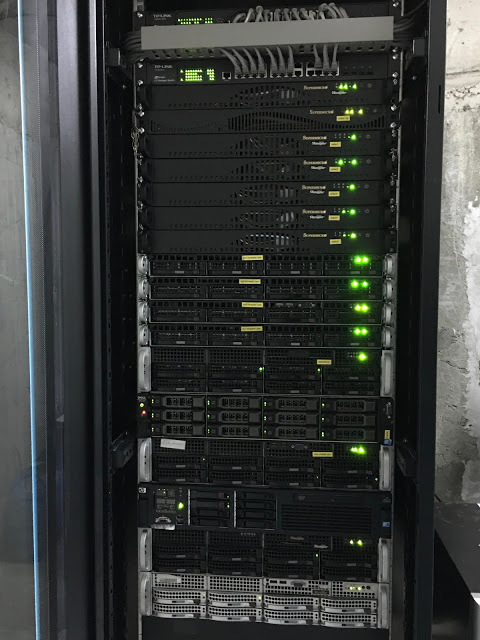 In the new rack we have a total of 120TB of raw storage, 1.2TB of RAM and 336 CPU cores. Each server is connected to the network with 2x10G network interfaces. That’s roughly 3 times the capacity and 10 times the network performance of our old setup with only half the physical servers! 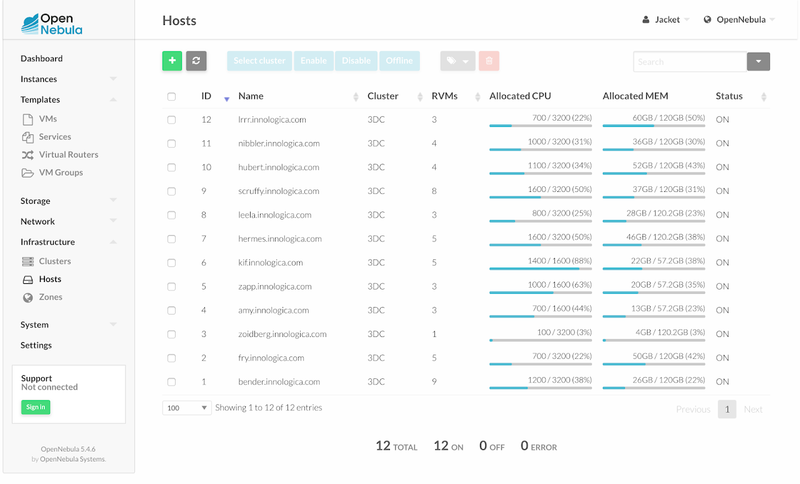 We now have more than 50 virtual machines because we have split some physical servers into several smaller VMs with load balancers for better load distribution and we have allocated more than 46TB of storage. We have 12 hypervisors with plenty of resources available on each of them. All of them are using the same model CPU, which gives us the ability to use the “host=passthrough” setting of QEMU to improve VM performance without the risk of VM crash during a live migration. I have mentioned a backup datacenter couple of times in this post. Not all of our servers were good candidates for becoming hypervisors. For example some of them were not compatible with Ivy Bridge CPUs, some were thicker 2U (rack units) servers and we really wanted to have only 1U hypervisors to save rack space. Also servers are usually optimized for storage and we still had plenty of 2TB drives lying around after the migration. So we quickly put them to work! In the basement of our office building, we have rented a room, equipped it with air conditioning and a big UPS and moved the less fortunate servers there. 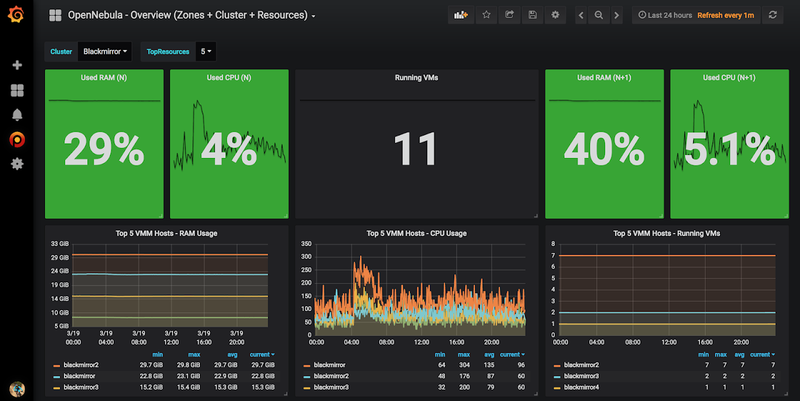 Here we now have one backup server with 20TB of storage for our daily VM snapshots and database backups, 3 nodes forming a 32TB Ceph cluster for operational storage and 4 hypervisors for a second, independent OpenNebula cluster from our main one and some other lower-priority servers. The idea is to have a fully working copy of our main datacenter that can be used in case of an emergency situation. It is intended to be a mirror for black days, so – Black Mirror. 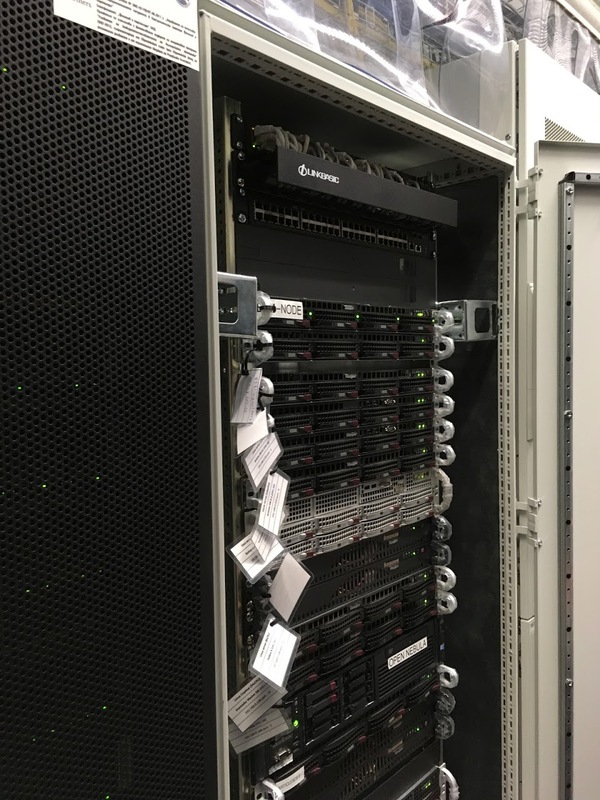 We now have all our data replicated in real time from our main data center so even in the highly unlikely event that some disaster happens there, we will still have everything off-site and we will be able to restore operations within less than an hour. 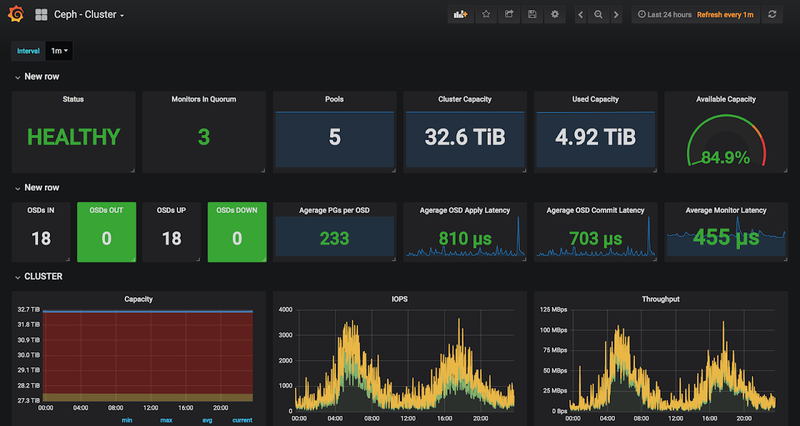 The reason we chose Ceph as a storage here is partially because we didn’t need the performance of our main datacenter, but also because we are tech nerds and we like to learn technologies, so this was the perfect opportunity. For the geeks interested in Ceph: Each of the nodes is equipped with 2 independent MegaRaid SAS 9271-4I controllers with 1G cache modules + BBU, each controlling 4 drives. 8 drives per node (2 for OS, 6 for Ceph). Drives are exported as single-disk RAID-0’s because we wanted to use the controller caches as much as possible. This is usually a very expensive setup, but we had those controllers lying around after the main project was completed and we wanted to put them to work. We are open for suggestions here, especially JBOD vs RAID, so if you are feeling geeky, tell us what you think in the comments below. 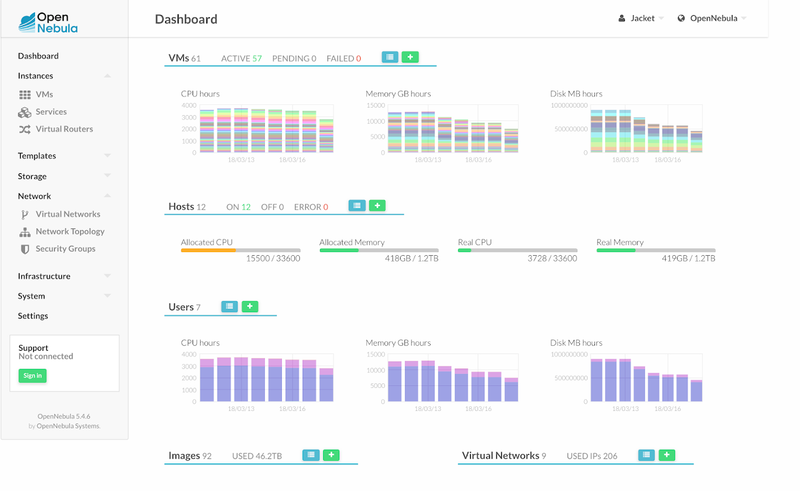 OpenNebula works quite well with Ceph. It has a built-in support for Ceph datastores and the setup is quite straightforward and well documented, so I’m not going to repeat it here. 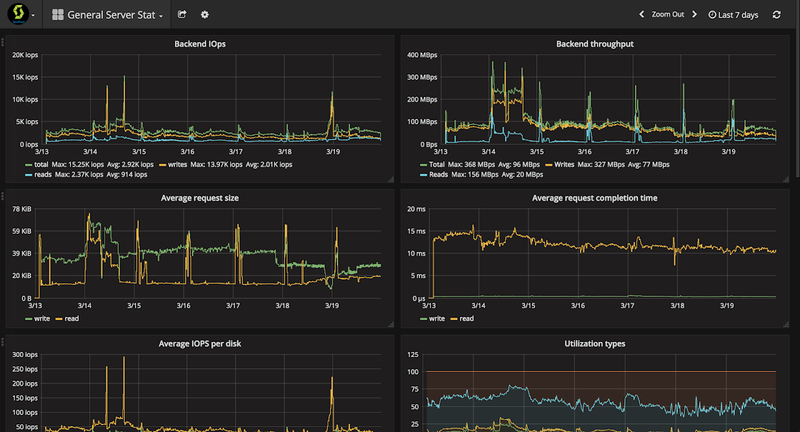 We have managed to plot some nice Ceph and OpenNebula dashboards in our Grafana too. We still have some connectivity issues from time to time, because we still use a single Internet provider in both DCs, even though we have acquired our own autonomous system back in 2016 – AS49663. We never found time to actually implement it. 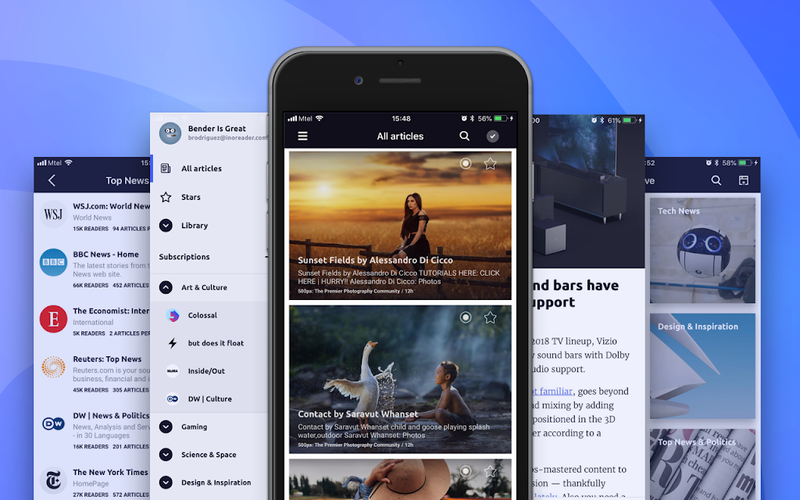 We will try to do that in the coming months to become more independent in terms of our Internet connectivity too. If you made it this far – Congratulations! You have geeked out as much as we did building this infrastructure. 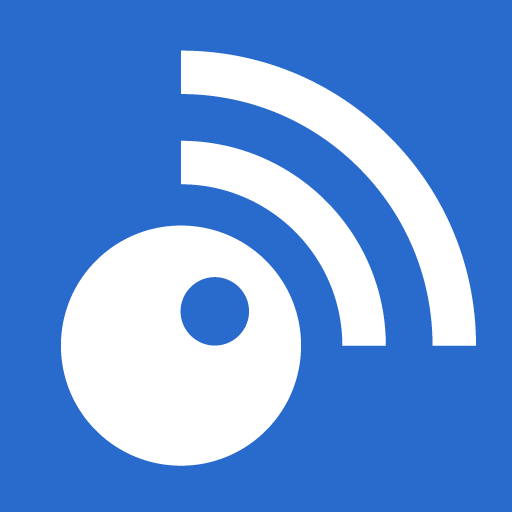 If you have ever doubted the future of Inoreader or our company, don’t do that anymore! We are here to stay and by upgrading our infrastructure with the latest and greatest technologies like OpenNebula and StorPool we are making sure that you will receive the best possible service with ultra-high performance and zero-downtime in years to come.